Young children grow in cognitive, physical, social, and emotional skills during the early childhood years. The Lynn Public Schools is committed to providing high-quality, developmentally appropriate, standards-based child-centered activities within a well-equipped, organized setting. We believe supporting a child's healthy development provides the basis for academic success, and promotes the foundation for becoming life-long learners. Each year, in accordance with state and federal law, cities and towns are mandated to implement a "Child Find" system for three and four year olds, and for all children who are of age to enter kindergarten, to identify any child who may be in need of special education services. In order to identify any potential need for special education services, children in Lynn are screened by trained staff of the Lynn Public Schools using the Early Screening Inventory, Revised Edition (ESI-R). This screening reviews a child's development in cognition, speech/language, fine and gross motor coordination, vision, and hearing. The screening takes approximately thirty minutes. If, as a result of the screening, potential areas of need are identified, the child is then referred to the school district's Special Education Department. The Special Education Department then contacts the parent/guardian for permission to conduct further evaluation in order to determine if there is a need for special education services. DO YOU HAVE ANY DEVELOPMENTAL CONCERNS REGARDING YOUR 3, 4, OR 5 YEAR OLD LYNN CHILD? Screening is intended only for children whose parents/guardians have developmental concerns about their child. In accordance with the Massachusetts General Law MGL (603 CMR 28.00: Special Education), the Lynn Public Schools has a number of Integrated Preschool Programs for children with and without special needs. The primary purpose of the program is to integrate three and four year old children with special needs in a preschool classroom with typically developing (non-special needs) four year old children serving as role models. The program provides children with special needs the opportunity to learn from their peers as well as from the instructional staff. A Preschool Lottery is held each year in the Spring. To be eligible for the lottery, children must be 4 years of age on or before September 1st of that year. PLEASE NOTE THAT TRANSPORTATION IS THE RESPONSIBILITY OF THE PARENT/GUARDIAN OF THE TYPICALLY DEVELOPING CHILD. A Preschool Lottery is held each year in the Spring. Children must be 4 years of age on or before September 1, 2019 in order to apply. Transportation is the responsibility of the parent or guardian. 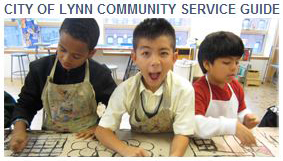 The Lynn Public Schools offers a full day kindergarten program to all Lynn children. Children who will be entering kindergarten in the fall must be five years old on or before September 1 of that year. Each classroom has highly qualified instructors, who use the Massachusetts Curriculum Frameworks incorporating the Common Core State Standards. All kindergarten programs offer developmentally appropriate opportunities that meet each child's needs. 1. During the last 2 weeks of August, create a routine for your family. Set an early bedtime and stick to it. 2. Work with your child in developing self help skills: tying their shoes, zipping their coats and using the bathroom independently. 3. Talk and listen to your child when you do something together (i.e., eating, shopping or taking a walk). 4. Use counting in your daily activities. For example, count the people in your family, toys, or pages in a book, etc. 5. Teach your child to resolve problems with siblings or friends using his/her words, not his/her hands. 6. Limit the amount of time your child spends watching TV and playing video games. (1 - 2 hours) each day. 7. Read to your child daily! After you read the story, talk about what you read with your child. 8. Have your child practice writing his/her first name. Encourage a correct pencil/crayon grip. 9. Turn driving in the car into fun by playing games such as pointing out familiar signs, finding letters, etc. 10. Encourage your child to be independent by allowing him/her to make certain choices - ("Do you want to wear your red shirt or blue shirt today?"). A comprehensive online list of helpful community and family resources. Use the link below to visit the City's new online Service Guide. Brain building is an investment that yields high returns. An investment in the economic prosperity of everyone in Massachusetts. Learn about the science of brain building and why our future depends on it. You will find helpful information and links for events happening in our area and around the state. Visit our Brain Building In Progress website! Please check back here frequently for news, information and updates!